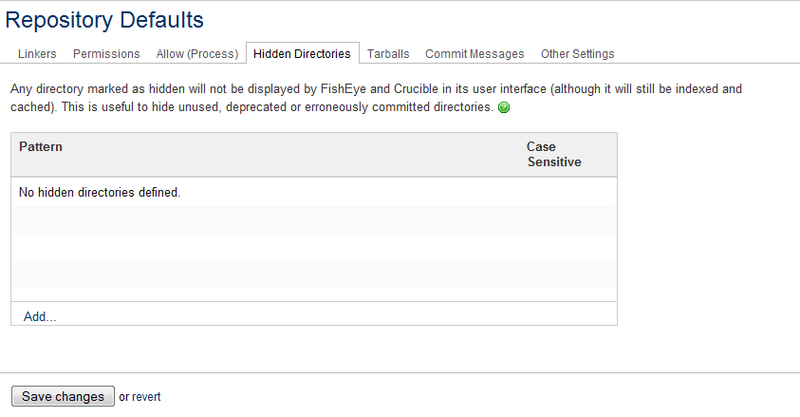 You can configure unused (deprecated) directories as 'hidden' in Fisheye. Hidden directories will not be shown to users in the Fisheye user interface, unless a user has specifically elected to view hidden directories in their user profile. This can be useful if you have old directories that you don't want cluttering the screens by default. Please note, Fisheye will still index and cache these directories. Note, this administration option does not affect the user's option of hiding empty directories and deleted files, when browsing a repository. See Browsing through a Repository for details. Click Repositories, and then the name of the repository, (in the 'Name' column). Click the Hidden Directories tab. 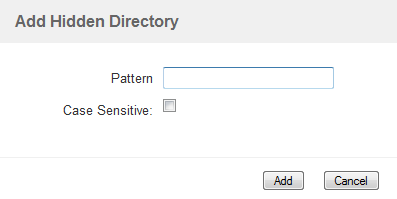 Click Add to add a new hidden directory pattern. See the Adding a Hidden Directory section below for further instructions. Click the cog icon ( ) next to a hidden directory pattern and then Edit to edit the pattern. Click the cog icon ( ) next to a hidden directory pattern and then Delete to delete the hidden directory pattern. Navigate to the hidden directories for a specific repository or the repository defaults, as described above, and click Add. Pattern — Enter an Ant Glob pattern for directories that you want to be hidden in Fisheye (see Pattern matching guide for additional information on Ant glob syntax). Case Sensitive — By default, hidden directory patterns are case-sensitive but they can be configured to be case-insensitive. If your repository is set to be case-insensitive (Perforce) then hidden directory patterns will also be case-insensitive, regardless of how the individual patterns are configured.